Another day of bolting things to it - front lights, orange wheels, bed, back lights have been put on, bonnet, sump guard, etc. The lights are all very cool. The doors will be painted soon. The weight of the back bed helps things. The lights and all the detailing are fantastic, mudguards and suchforth. The back no longer looks an afterthought, and the orange flasher is great. 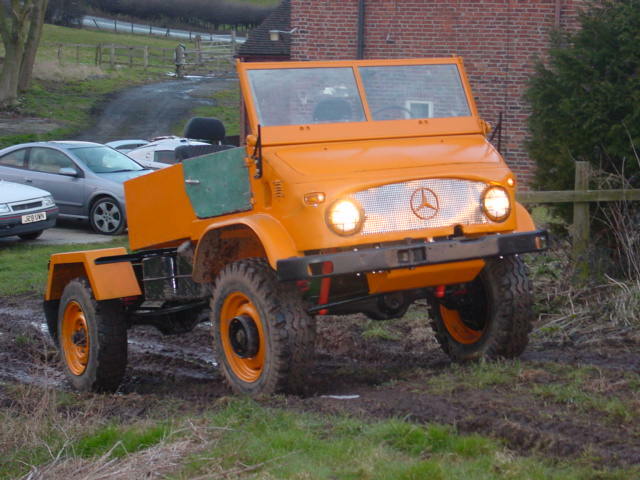 The bed is attached fairly sympathetically, and _should_ twist with the chassis. It'll never get enough weight on for a real workout. The interior is much better now as well, having all the doghouse covers on makes it much quieter, we also have the steering direction indicator now. 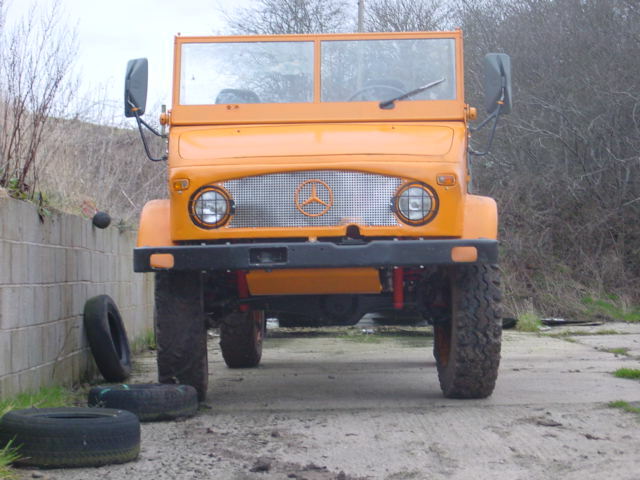 I'm waiting for a proof of age certificate from Ma Benz, then it's time for an MOT. Me? 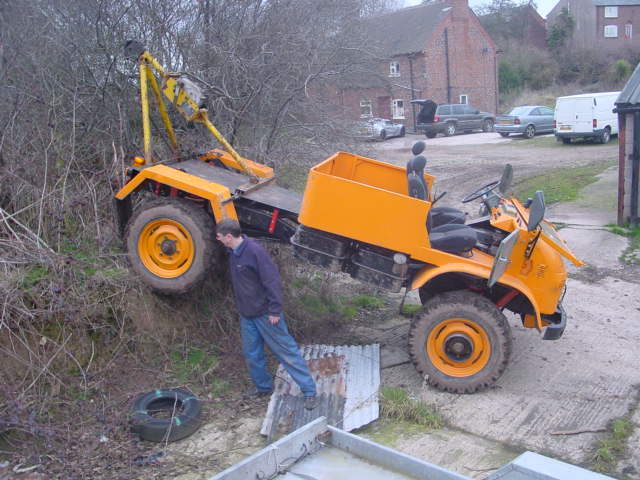 Get the mog stuck? In Mud? And bend the door? 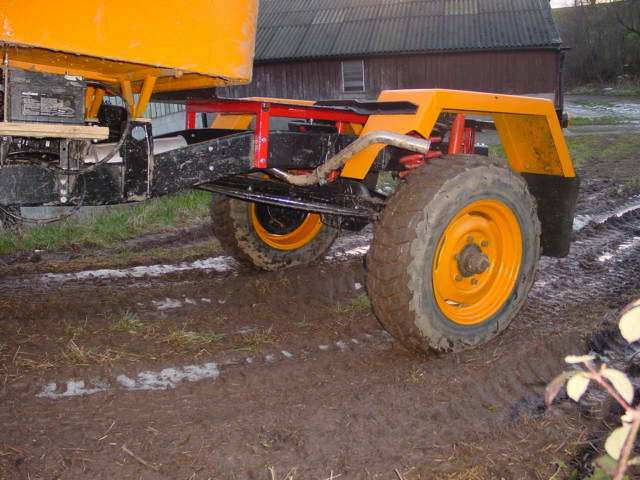 Trying to get the very most out of the farm, I tried a new, erm, slant on things. The back wheels just slid down a banking, and it got to resting on the door!!! 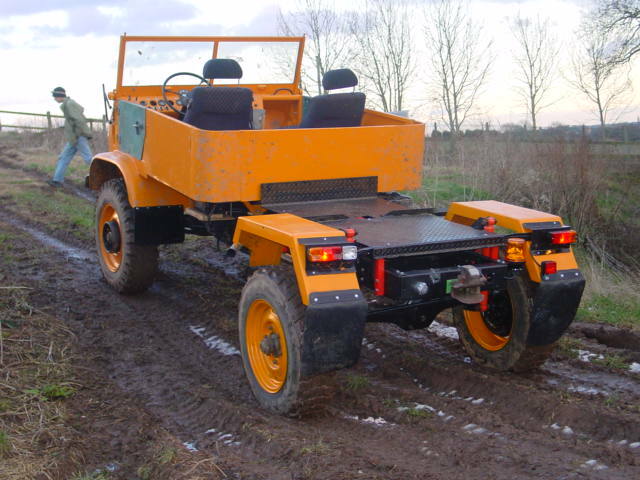 We took the windscreen off, put some gravel under the wheels and booted it. Which worked, except I broke one of the brand new back light lenses! How many of these bits start with "just a few more bits". 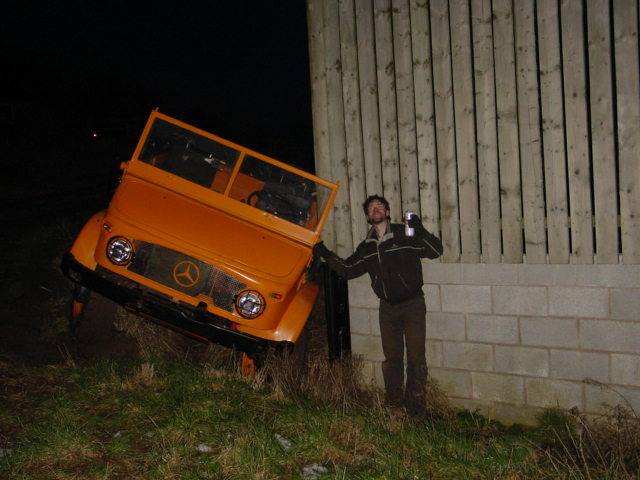 Well, we've put the crane on so it matches its registration documents, and got the mother of all door mirrors. It's good to have a crane, we're just short of things to lift. 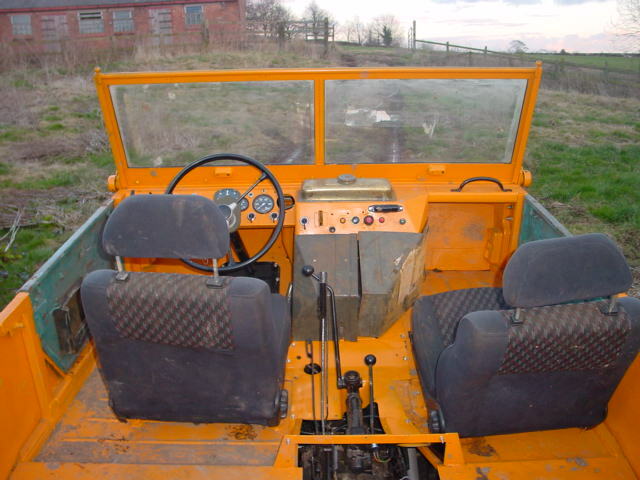 We're also a bit bored with the farm, and have taken to driving round looking for new challenges. 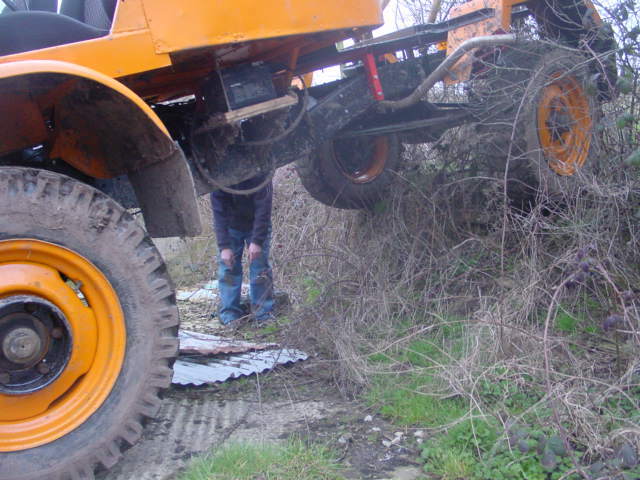 We found one, but even though there was a metre of vertical mud, the mog didn't really notice. Didn't even have to lock the diffs. 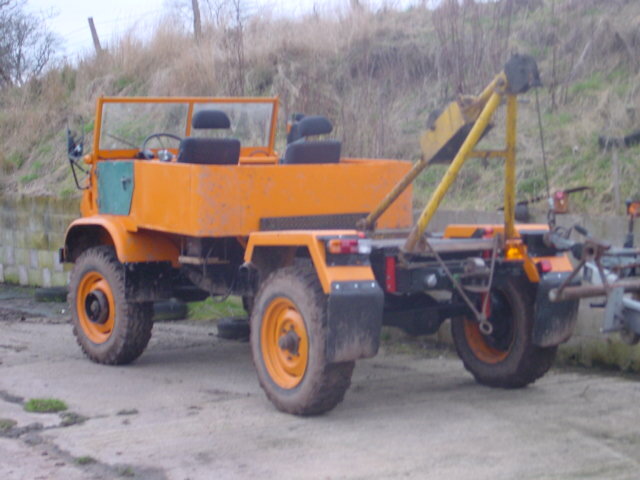 We've also been driving round in 2wd much more since having the back bed and crane on. The weight actually gives it some traction. Can't wait to get it off road. There's a nice video (5mb mpg) of derek driving back down. Check the levely noise it makes.